Meet Dr. John | Dr. Thomas John, M.D. 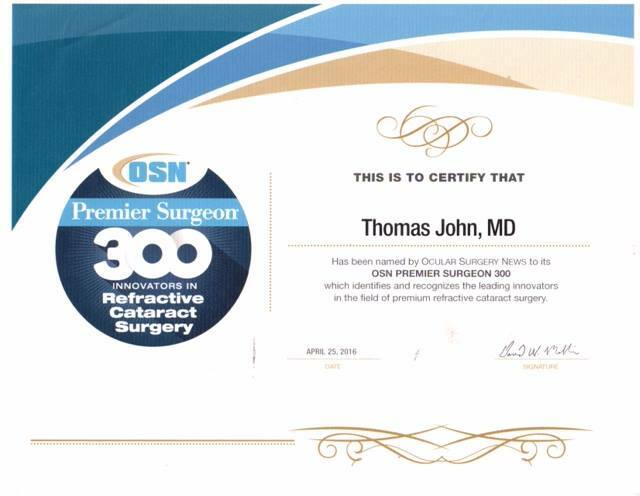 Dr. Thomas John is a world renowned ophthalmic surgeon. He is one of the world leaders in lamellar corneal surgery with three textbooks that he has edited on lamellar keratoplasty. He has trained other corneal surgeons from the United States and from other parts of the world in DSAEK surgery. He is a Clinical Associate Professor, Loyola University at Chicago, and is in private practice in the suburbs of Chicago, namely, Tinley Park and Oak Lawn, Illinois. 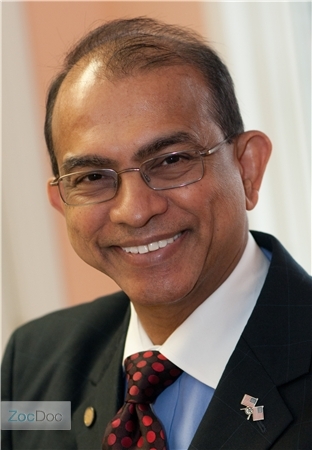 He is the Editor-in-Chief of the journal Techniques in Ophthalmology, a journal that deals with various ophthalmic surgical techniques and is the Associate Editor of the journal Annals of Ophthalmology. He is the Editor of the column Corneal Dissection in Ocular Surgery News. He is also on the editorial boards of other ophthalmic publications. He has received the Honor Award and Senior Achievement Award from the American Academy of Ophthalmology (2009) for his contributions in the field of ophthalmology. He was an invited speaker from the United States, invited by prestigious ophthalmic societies to other countries in the world including Italy, Finland, Peru, India, Greece, and Serbia. He has given numerous presentations both in the United States and around the world. He is a patent holder, and the inventor of many advanced corneal surgery instruments for lamellar keratoplasty procedures and device for eye surgery. He completed a 2-year Clinical Cornea Fellowship at the Harvard Medical School, Massachusetts Eye and Ear Infirmary, Boston, Massachusetts. He was a Postdoctoral Associate, Department of Applied Biological Science, Massachusetts Institute of Technology (MIT) in Cambridge, Massachusetts. He completed his Ophthalmology Residency at the University of Pennsylvania School of Medicine, in Philadelphia, Pennsylvania. He completed his medical studies at St. John’s Medical College Bangalore, India. Both his parents were ophthalmologists and his father trained in USA and in England. Dr. John is a former Director of Cornea Service, University of Chicago, the Pritzker School of Medicine, Department of Ophthalmology and Visual Science, Chicago, Illinois. 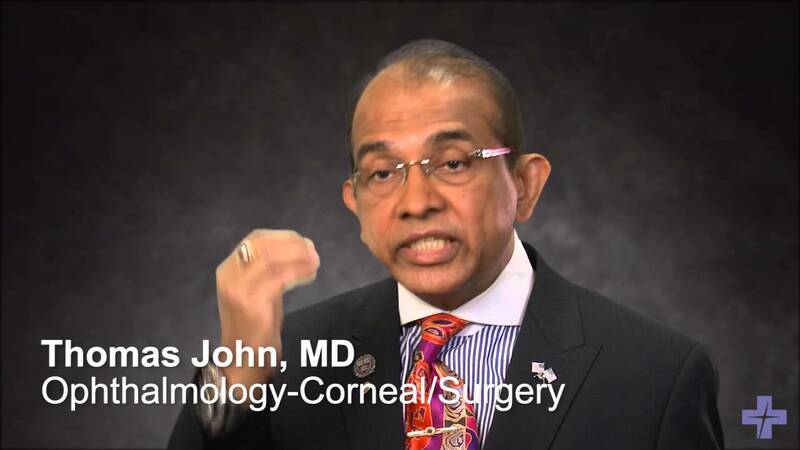 Dr. John has received many awards such as “America’s Top Doctor” (CCL), “Chicago’s Top Doctor” (Chicago Magazine), and last but not least “America’s Top Ophthalmologist” (CRC). He has also been on the America’s top doctor list in Chicago Magazine from 2007-2009. In November 2006, he was awarded the Physician Medal of Distinction by the Military-Medical Academy in Belgrade, Serbia. Also in November 2006, he received theDistinguished Physician Award from the Indian American Medical Association (IAMA) in Chicago, IL. Dr. John received the Honor Awardand the Senior Achievement Award from the American Academy of Ophthalmology (2009). He recently performed live surgery namely, no-stitch corneal transplant (no corneal sutures) in Venice, Italy. In February 2008, he was the invited speaker from the United States to a major Italian conference in Milan, Italy, where he taught sutureless corneal transplantation techniques to Italian eye surgeons. He also teaches US corneal surgeons and surgeons from other parts of the world in his live surgical course here in the Chicago suburbs. He was the invited speaker to Finland. He was invited by the Finnish Ophthalmologic Society. He also gave invited talks at the Indian Ophthalmological Society and at the last Ophthalmology Congress in Brazil. He was the invited speaker from the United States and presented talks at the Greek Ophthalmology Congress in Athens, Greece in February 2009. Dr. John has also published a surgical video and has been an invited speaker to many prestigious ophthalmology conferences. He has also published numerous scientific articles in ophthalmology journals, presented papers at national and international meetings (Also see News and Publications in this website). Dr. John is the Editor-in-Chief of the journal Techniques in Ophthalmology, and the Associate Editor of the journal Annals of Ophthalmology. He is the editor of the surgical column in Ocular Surgery News called Corneal Dissection. He is the department head of Cornea in Reviews of Ophthalmology. He is also on the editorial board of other ophthalmic publications. He is a consultant to ophthalmic companies such as Vistakon, Inc., Inspire Inc., and on the speaker bureau of several ophthalmic companies in the United States. He has taught surgical techniques to other ophthalmic surgeons from all over the United States and internationally. He also teaches medical students and residents in ophthalmology training. He performs LASIK and other refractive surgeries, no-stitch, no-patch, no-injection cataract surgery with premium intraocular lens implant which help in decreasing the dependence on glasses for both reading and distant vision. He performs and innovates new corneal surgical techniques. He also performs glaucoma surgery, amniotic membrane transplantation, and other surgical procedures. Board certified ophthalmologist, and clinical associate Professor Loyola University, Chicago. Former Director of Cornea Service, University of Chicago. Known to be a world leader in lamellar keratoplasty and sutureless ( no corneal sutures) corneal transplant. Teaches a live surgery course in Chicago. Editor of Ocular Surgery News Corneal Dissection Column. Associate Editor of Annals of Ophthalmology. Editor-in-chief, Techniques in Ophthalmology journal. On the editorial boards of other publications. Published extensively and lectures nationally and internationally. Received first place awards for his surgical videos from AAO, ASCRS, and ISRS. Named as one of the nation’s leading medical specialists in America’s Top Doctors, America’s Top Ophthalmologist ( RCA) Chicago Top Doctor, Chicago magazine. Senior Achievement award from the American Academy of Ophthalmology 2009. In November 2006, he was awarded the Physician Medal of Distinction by the Military-Medical Academy in Belgrade, Serbia. February 2008, he was the invited speaker from the United States to a major Italian conference in Milan, Italy, where he taught sutureless corneal transplantation techniques to Italian eye surgeons. Teaches US corneal surgeons in his live surgical course here in the Chicago suburbs. Gave invited talks at the Indian Ophthalmological Society and at the last World Ophthalmology Congress in Brazil. Invited as a speaker to several countries globally including Finland, Italy, India, Greece, Serbia, Brazil and Peru. Call the office today to make an appointment to meet Dr. John in person so that you can discuss your eye condition with Dr. John.